This queen size solid walnut bed is slightly taller than normal, and has four large built-in storage drawers under the bed. It is available as a headboard only, a complete bed with rails and footboard, with or without the storage. 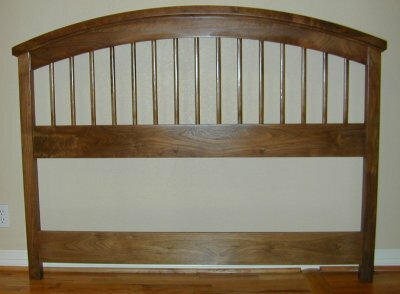 This headboard is similar to the bed above, with spindles to make the headboard interesting. It can be used with either a full or queen size bed frame. The board at the top that holds the spindles goes all the way through to the top curved surface. Another board is added on the front, with a cove in the bottom, to add thickness. A third board is added at the back to complete the top. Solid hardwood posts extend to the floor. Cherry headboard with solid (furniture grade plywood) back, and solid hardwood legs and top trim. The trim is three layers of wood that is flush across the top, with a cove cut into the lower edge of the front piece. Other types of wood can be used as well. When that rather plain looking headboard is built into a complete bedroom with the guest-style night stands, it becomes an attractive room. A customer wanted a full size bed that had 26 inches clear space under the bed (rather than the usual 8 inches). It was to be a platform bed... just a mattress with no box springs, so we normally build a "torsion box" to support the mattress - an inside grid like an airplane wing, with thin skins to save weight. She did not want high wood sides... so she could sit on the edge of the bed, but the sides extended high enough to keep the mattress in place, and hung below the frame enough to add stiffness. The solid box and sides that hold the mattress are a single piece, so the legs are removable. Boards inside the legs hold the weight, with just a couple screws to keep the legs in place if the bed is lifted. 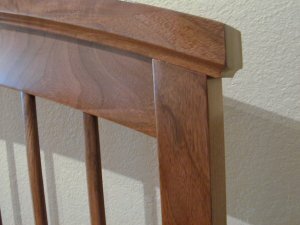 The headboard keeps the bed from swaying side to side; small triangles keep the bed from swaying end-to-end. The inside of the torsion box has a grid of supports to keep the "skin" in position - it provides amazing strength at minimal weight, but you can't step on the box without a mattress - your foot could go through the skin if you stepped between the supports. Unfortunately federal regulations have made it impractical to make custom furniture for anyone under 13 years old, but I was commissioned to build three queen size bunk beds prior to the new regulations. Six boys, three bedrooms, but the older boys were too tall for regular beds, so queen size was the solution. To add to the challenge, the too-tall boys had to be able to sit up in the lower bunk to read, so the beds were VERY tall - the upper headboard was about 8 feet above the floor. Cherry wood was chosen. The bedroom ceilings were tall enough, but the ceiling fans had to be raised! But it shows the kind of challenge I enjoy! The height of the headboard at the ends - at the legs - is about 40 inches. The center of the headboard is about 6 inches higher. A headboard without a footboard is normally attached to a metal bed frame, which is about the same width as the mattress and box springs (60 inches for a queen size bed) so the overall width of the headboard is about 60 inches. 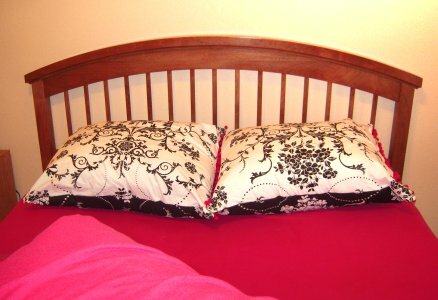 The bottom of the headboard needs to be low enough so that pillows cannot escape from the bed - someplace about 22 to 28 inches above the floor. This headboard goes down to about 17 inches above the floor (see below). What are the silly ears at the bottom? A full size double bed is only about 5 inches narrower than a queen size bed, so you may want to use a queen size headboard on the smaller bed (to provide future flexibility). Those small boards allow a narrower frame to be attached to the headboard. The frame typically holds the mattress about 8 inches above the floor, and the headboard attaches to the frame at about that height. Those ears extend from about 3 inches to 9 inches above the floor (see below). Normally the headboard legs rest on the floor, to provide additional stability. However, you might want to raise the headboard an inch or so off the floor to allow the existing casters to roll the bed, or you might want to raise the headboard several inches to allow thicker mattresses or large pillow collections. 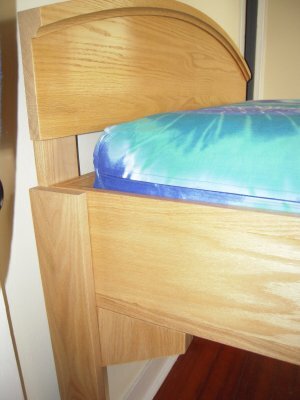 If the headboard is raised, then the connection point for a narrow bed needs to be lower, and the bottom of the headboard needs to be lower, as noted above. 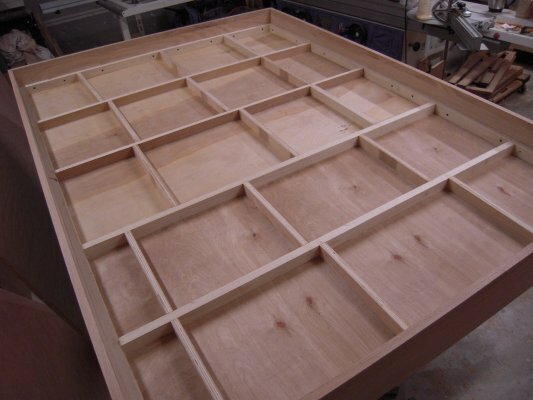 Construction details for the bed with storage. A queen size mattress is 60 inches wide and 80 inches long. This bed is designed for the queen size mattress, and is a total of about 66 inches wide, with 60 1/2 inches between the rails, and 82 inches between the head and foot boards. At the user's request the mattress is about 4 inches higher than usual, which with a "pillow top" mattress makes the top of the mattress over 32 inches high. The top of the headboard is 54 inches above the floor, the footboard is 35 inches. The head and foot boards are almost 3 inches thick, glued up from 3 boards after machining. The center board is 4 1/4 inch high, with each board glued to the front and back at 2 1/4 inches high at the head, and 1 1/2 inches high at the foot, before cutting a 1/2 inch cove along the length. The spindles are roughly oval, 3/4 inch wide on 4 inch centers (meeting the safety standard of gaps no larger than 3 1/2 inches). A router was used to round over all four corners of 1/2 by 3/4 inches boards, fitting them into mortise holes made by drilling overlapping 1/2 inch holes. The extra height of the bed gave room underneath for four storage drawers, each about 2 feet by 2 feet. The drawers are set back from the edge of the bed, to avoid stubbing toes, thus are suitable for seasonal storage, but are not convenient for daily use. The drawers are slightly above the floor when closed, to provide ventilation under the bed. 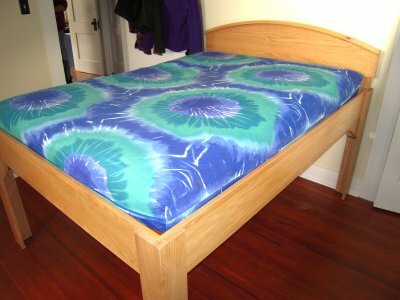 A bed can be made for any standard mattress size, and in a wide variety of designs. 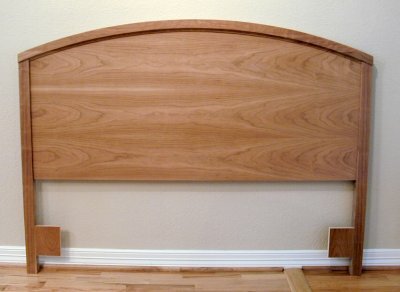 A queen size headboard will normally be provided with a small extra board that allows it to be used with either a queen or a regular "full size" bed frame, as seen above. The mattress bottom is normally about 8 inches above the floor. The bed shown above was 12 inches above the floor, giving room for under-bed storage, and the tall platform bed was 26 inches above the floor. This site (design and contents ©2003-2017 by Charles A. Plesums, Austin, Texas USA. ALL RIGHTS RESERVED.